In 1985, the 13 vegetation types below were identified in Jordan by Professor Dawud Al-Eisawi. The first five vegetation types correspond to whole habitats we are re-creating within the Royal Botanic Garden. Aleppo Pine Vegetation: Found in forests at high altitudes, starting at 700 m above sea level. Examples are found in Jerash, Dibeen, Ajloun and Zai. Deciduous Oak Forest: Grows at lower altitudes than most of Jordan’s forests, in Um Qais, Yarmouk River, Ajloun and near King Talal dam. Juniper Forest: Found in the southern highlands of Jordan, usually at altitudes exceeding 1000 m a.s.l, in areas that receive an annual snowfall like Rashadiyya, Dana in Tafila, Shawbak and Wadi Musa. Often Cypress and Pistachio grow alongside the Juniper. Tropical Vegetation: Resembles Sudanian vegetation and dominant near the Dead Sea, although most areas representing this vegetation have been turned into farms, except in Ghor Fifa. Water Vegetation: Found in wadis and around springs and watercourses, in locations such as Yarmouk River, Zarqa River, Wadi Shu’aib, Wadi Mujib and Wadi Al Hasa. Saline Vegetation: Characterized by plants that tolerate a high salt content in the soil, found in the Saharo-Arabian zone around Azraq oasis, in the Ghor area and along the Dead Sea shore. 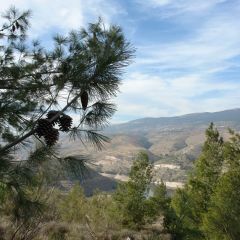 Evergreen Oak Forest: Grows at above 700 m asl, found in Ajloun, Jarash, Salt, Tafila, and between Shawbak and Petra. Sand Dune Vegetation: Characterized by shrubs that are able to fix sand dunes that might reach 3 m in height, well represented in Wadi Araba and Wadi Rum. Acacia Vegetation: Found in mountainous and rocky areas of Wadi Araba, Aqaba, Wadi Yutum and Wadi Rum . Mediterranean Non-Forest Vegetation: Composed of shrubs, following degradation of a forest. Steppe Vegetation: Characterized by bushes and shrubs, in the Irano-turanian zone with a few penetrations in the Saharo-Arabian and Mediterranean zones, as seen in Mujib. Mud Flat Vegetation: Found in the Saharo-Arabian zone, especially where water is present along with mud and granite soils, as in Azraq and Al Jafer. Hammad Vegetation: Forms most of the Saharo-Arabian zone, characterized by vegetation that can tolerate the salinity and hot weather such as in the Eastern Desert. From left to right below, the five Jordanian habitats re-created at the Royal Botanic Garden: Deciduous Oak Forest, Pine Forest, Jordan Valley, Juniper Forest and Freshwater Habitat. For photo galleries of native Jordanian plants, click on a habitat below.